Villa Bozenna es una nueva casa de diseño contemporáneo en la zona residencial de Rincón de Guayabitos. Su interior de 1.840 pies cuadrados incluye tres dormitorios con 2½ baños, que es perfecto para tres parejas o familias más grandes. Las cómodas áreas de estar a la sombra y la cocina de concepto abierto combinan una sensación de intimidad con el entorno natural del mar y la brisa tropical. En Villa Bozenna, puede disfrutar nadando en la piscina de agua dulce de 20 metros o relajarse con una bebida refrescante en el patio con vista al mar en la azotea. Estás a solo una manzana de la playa, con acceso a toda la diversión local. Nuestra comunidad está orgullosa de su entorno seguro y protegido. Rincón de Guayabitos se encuentra a 45 minutos en coche escénico al norte de las animadas escenas de playa de Puerto Vallarta, Buceria y Sayulita, a través de la jungla antigua y pequeñas ciudades únicas. Hay tanto que hacer aquí en Rincón de Guayabitos, La Peñita y Los Ayala ... pesca, kayak, golf, tenis, yoga, cabalgatas, avistamiento de ballenas y pájaros, tequila tours, compras, paseos en bote en la jungla o incluso un relajante masaje en la playa. Para los más aventureros, hay varias compañías de turismo cercanas que ofrecen natación con delfines, surf, buceo de superficie, ciclismo de montaña, safaris en jeep todo terreno e incluso una emocionante excursión en tirolina. We had a terrific time at the villa. David the caretaker is always around to help out and has great suggestions. The rooms are large and the cleaner is there twice a week which is a huge bonus! 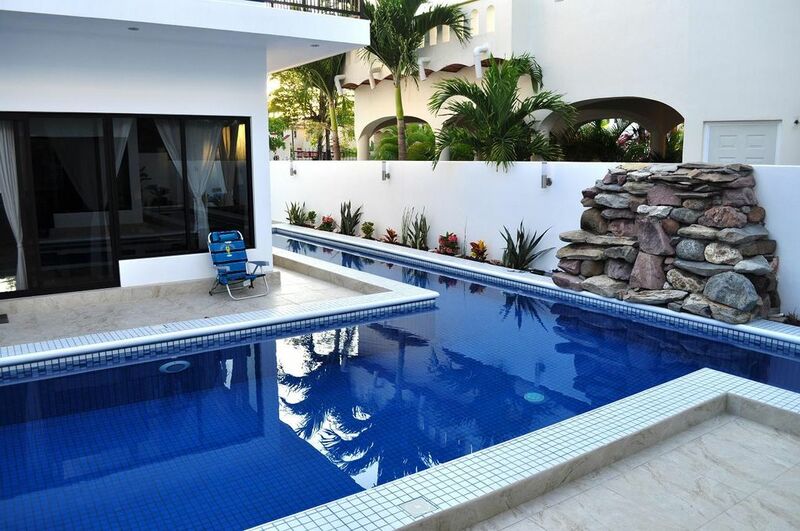 The house is attached to another and the pool is shared if the owner is in town. This wasn’t a big deal to us but it might bother others if you want total privacy. The pool was great after a hot day. The kitchen is equipt with basic supplies so if you want spices etc. bring from home. We found it had what we needed to make breakfast and lunch. We ate out mostly for dinners so it really didn’t matter. Internet was great, no issues. The location is terrific and the walk to the beach is under five minutes. We would come back for sure ! Love the locals and the beach is so perfect for families and boogie boarding. Thanks for a great stay. Our stay was amazing and would reccomend this place to anybody!! David was extremwly accomadating and always made sure we had everytging we needed! The maid services were exceptional!! Very close to the beach and a short walk to La Penita was nice as the market opens on thursday and lots of neat stuff there!! The pictures and description of Villa Bozenna is everything described online and more!! Great for families or couples as the space is very big open with lots of privacy. Cant say enough good things about our stay and will defenitely be back!! Our stay at Villa Bozenna was fantastic, it felt like a rental in Florida not Mexico. Its located close to the beach and walking distance to shopping, dinner out and anything else you will need. If needed you can always take a taxi for only 10 p a person. We felt the home was a great value for the price, we have stayed in many places in the area and would definitely recommend this one. It is spacious and very clean. No Mexican septic spell in the bathrooms, it was very fresh. The kitchen was well equipped with everything we needed to make all meals. Drinking water was available to take when ever we needed. There is a washer and dryer to use and an out door bathroom with shower. This was great to wash the kids off after being at the beach. David and Roman were fantastic and always available if needed. David would check in when he cleaned the pool to see if we need anything. He gave us some great options on where to go out to eat and where to get fresh seafood. The house next door is close but we knew this by looking at the pictures before renting. This didn't bother us, the owners respected our privacy and were very friendly. If you want privacy you can always close your blinds. This property was extremely safe, all the gates locked and we left our computers out with no problems. There is twice a week maid service, this was a fantastic surprise, especial for our family of 7. Being close to the ocean some of the stainless steal in the house has oxidisation one it. This common in any home located close to the ocean so was no surprise. The internet was slower as it is in most places in Mexico but I was still able to do my work, send emails, do my contracts etc. We were on vacation and not needing to spend our time in the Wi-Fi. We did have a rainy day and enjoyed the large selection of movies available on the TV for our family movie night. We will definitely be coming back and would highly recommend this property to anyone. Thank you Jazz. It was my pleasure to meet you and your very friendly and beautiful family. The property itself is very well appointed. The very thing I was worried about was privacy and it was an issue. At this price level there were other pros and cons. Pros: Beautiful home, well equipped, parking. Great rental for a large family. Caretaker, Richard, is always close by and very helpful. Cons: The WiFi is a joke as email does not load and you can forget streaming anything. Sporadic hot water. Pots and pans were dirty. Knives were rusted. The coffee maker was absolutely gross. Lack of privacy. I am not comfortable continually looking across the common area and 16' away they are watching your every move. Again at this price level, we would have expected much more than were led to believe. The lack of WiFi (only ever made it to 1.68) meant I could not work or even Face Time. I would think more than twice about renting this property. There are two houses on this property. They are separated by the swimming pool and patio space on each side. There are curtains on the pool side with the exception of the kitchen window over the sink. There were two people in the other house, and if they were doing dishes or preparing at the kitchen sink at the same time, yes they would see each other across the pool and patio space. The other house in not occupied for much of the year, as it used by the owner and family sporadically. The family that was in the house prior to these guests left the house in a very neat state. They had left just before these guests arrived. They had put the dishes and pots and pans away prior to maid service. Had it been brought to our attention that they were not clean, this would have been looked after in short order. We are very close to the ocean, and unfortunately if the guests to not dry the knives, they do tend to oxidize. Again, if this was noted or if we had been advised, it would have been looked after. The hot water is an on demand system, and although you might have to wait 10 seconds or so until it reaches the tap, it is continuous until you turn off the tap. It is a new heater, and no problems could be found with the hot water after these guests left. These guests were here for 3 nights. Upon arrival they were provided with the personal phone number of the manager, who lives a very short distance away. Should they have brought these issues to his attention at the time, all would have been resolved in short order, with the exception of the internet. We will try our best to improve service for our valuable customers. Amazing home away from home to spend the holidays! Villa Bozenna was the perfect location for our family of 5 to start a new family tradition of travelling over the holidays. The 9 year old loved having a pool so close at hand, and the teenagers enjoyed the closeness to the beach. The kids liked having access to Wifi, although it was patchy at times (which we were told to expect), to keep in touch with their friends and stream videos. The house has very clean and the the mid-week cleaning was a pleasant surprise. We appreciated that Dave and Roman were extremely approachable and took care of any problems that arose. It took a little time for the hot water to make it to the showers, and the knives in the kitchen could be replaced; however, those inconveniences were minor when the whole experience was taken into consideration. Thanks for sharing Villa Bozenna with us! We hope to be back someday! 50% Deposit required and balance 30 days before arrival. Special rate is available.